^ 4.0 4.1 Yaffa, Joshua. The Road to Clarity. The New York Times Magazine. August 11, 2007 [August 11, 2007]. .
^ Nadeau, Gregory G. Notice of Termination of Interim Approval IA-5. Federal Register (Office of the Federal Register). 25 January 2016, 81 (15): 4083–4084 [31 January 2016]. ^ Diaz-Balart, Jose. Report 114-606: Report Together with Minority Views [To Accompany H.R. 5394] (PDF). 114th Congress 2d Session. United States House of Representatives: 31. June 7, 2016 [September 26, 2016]. ^ Red Hat releases free/libre Overpass font family. libregraphicsworld.org. ^ Arizona Manual of Approved Signs. Arizona Department of Transportation. [February 9, 2016]. ^ Chapter 8: Letras y números para señales (PDF). Manual de dispositivos para el control del tránsito en calles y carreteras 5th. Mexico: Secretaría de Comunicaciones y Transportes. 1986: 425–486. ISBN 968-803-140-2 （西班牙语）. Road Geek 2014 - is a set of fonts that replicates typefaces used on highway signs in various countries. FontSpace's Highway Category - Includes Mike Adams' fonts plus others (some personal use only, some commercial friendly). 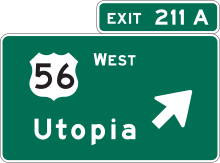 Public domain fonts used on road signs.